With resolve in her voice Irma declared “I’m going to start praying 30 minutes a day!” Two weeks later the best she’s done so far is 12.4 minutes. Kevin told friends he was going to start reading a Christian classic a month. Starting with Bunyan’s Pilgrim’s Progress, he (Kevin, not Bunyan) got bogged down in the third chapter and never finished. He feels guilty. Although I know intellectually that God just wants me to love Him with everything I am and have, I sometimes find myself deciding how close to or far from that goal I am by measuring prayer minutes, comparing myself to other’s evangelistic zeal, etc. And despairing. 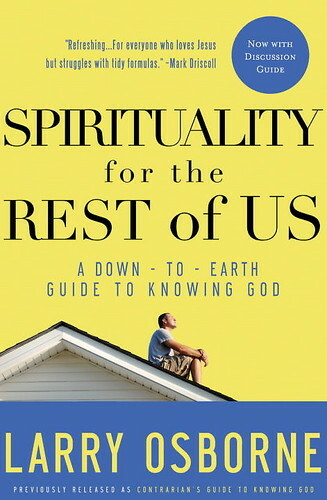 I can only describe Larry Osborne’s Spirituality for the Rest of Us as a breath of fresh air. 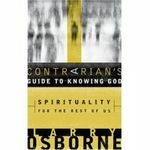 Originally published in 2007 as A Contrarian’s Guide to Knowing God, Osborne, a west coast Free Church pastor known for the multiple worship venue innovation, gives hope to Christians who don’t fit the spiritual-growth molds cast by well-intentioned Christians. Like pastors. But even if you don’t read many Christian books, or don’t fast, or don’t pray as long as someone else, or don’t positively confess, or aren’t as emotionally as bouncy as others about Jesus, or can’t seem to memorize Scripture, maybe you can still know Him deeply even if you don’t do things like I do, or like someone else does. Larry introduces the book with a frustration I resonate with: the “must see” marriage conference (or book, or retreat) that told him and his wife how to have a great marriage. We viewed our relationship as characterized by oneness of spirit, soul, and mind–a connectedness that made us one. But the books and conferences informed us that we were doing it all wrong. We weren’t eating enough meals together, the TV was on too much, our date nights were far too rare, and our prayer time as a couple was sorely lacking. The message was clear: The fact that we had a strong marriage didn’t matter; how we got there was what mattered most. And we’d apparently gotten there the wrong way. Their tools for building a strong marriage had somehow become the measure of a great marriage. I think you’ll be surprised–maybe initially even alarmed at chapters like “Why Results Don’t Matter” and “Glass House Living”, but press on; it’ll be well worth it. Sounds like a book that points straight to the gospel. I think encouraging each other in our battles is a highly effective strategy against sin. We may not eradicate sin, but we can stand along side each other in the fight. Next Next post: Just for fun..